Remember when the holidays were… easy? 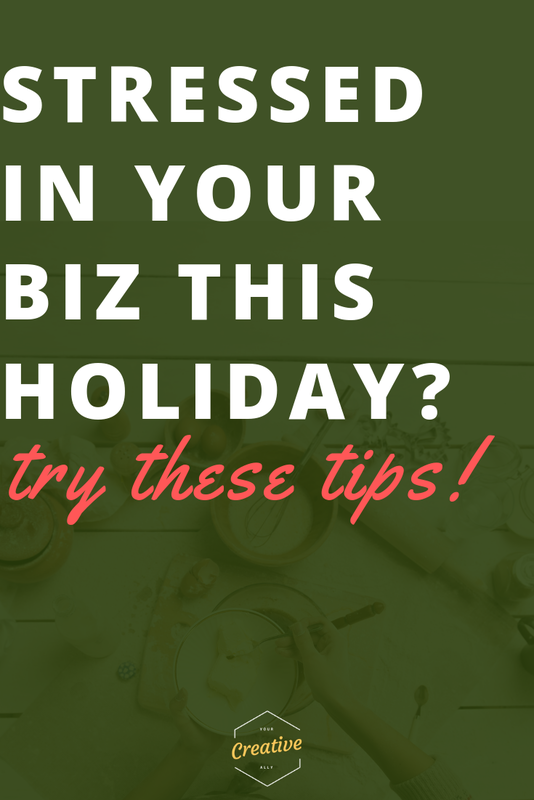 If you are a business owner, you know that the days of stress-free Christmas holidays are long gone. What if you could actually enjoy the holidays this year, instead of frantically sending emails on Christmas Eve, when there are presents to wrap? Okay, let’s dive on into this holiday rescue mission, shall we? Are you a do-it-all person? Guilty. As. Charged. As a creative person, you probably have a million ideas swirling around in your head at all times. Content ideas, marketing ideas, new streams of income. There is an endless to-do list filling up your brain at all times. Enter Christmas. Christmas is a pivotal time for business. You are on hyperdrive trying to sell to a world that is lining up to purchase. And, of course, you are competing with a world of other eager business owners, as well as the big chain companies. So, how do you manage a successful Christmas sales season, without working yourself to exhaustion? Prioritize. You can’t do it all. You are one person. So, it’s time to narrow down your goals for this year’s holiday season. Make Macro Goals: Pick your projects wisely. Be brutally honest about what you can handle. If you are selling physical products, set deadlines for the last date a buyer can purchase, in order to have their gift by Christmas. If you are selling services, think about one big strategy, maybe a holiday discount, and how you can implement it. Make Temporal Goals: Once you have picked your overall goals, you need to evaluate the time that you have for your holiday business plan. What date would you like to have your goals completed by? How can you schedule your work to carve out a holiday season for yourself? Be Specific in Your Daily Goals: The more specific you are with yourself, the less distracted you will become as the holiday months arrive. If you are clear with yourself on what goals you want to accomplish, and in what timeframe, you will be less likely to find yourself distracted in the hustle and bustle. Okay, you get it. Again, be specific with what you need in order to make your goal succeed. How do you need to get organized? Maybe you need to set up canned emails for easy responses to your inquiries. Maybe you need to plan out your next month in your planner. Maybe you need to work on more focused, less distracted working time to maximize your efficiency. Whatever you need to get organized, make it happen! Also, set boundaries. Do not work all morning and all night long. Do not stress yourself out so much that you make yourself sick. Do not work so much that you miss the holiday season altogether. Remember that you are not your business. You have to be #1, and the business is #2. Again, you cannot do it all. You are one person! Because you’re the brains of this operation, your focus needs to be on the creative side, the planning side. You do not need to spend your energy on answering email after email or creating Pinterest graphics or writing blog posts. Let me suggest that you phone a friend. If you’ve never heard of a Virtual Assistant (VA), or if you have never worked with one, there has NEVER been a better time than the holiday season. Can you imagine getting five or ten or twenty hours back that you spend on tasks that don’t maximize your skills? That is where a VA comes into play. You can hire a virtual assistant for the holiday season to take on the tasks that are sucking up your time. And maybe… you will actually enjoy your Christmas vacation again. Imagine that! Your Creative Ally is a virtual assistant business that is designed to help YOU and your needs. We are a completely customizable, because you know your business needs better than anyone else. Don’t try to do everything this holiday season. Phone a friend. Get an ally. And drink a lot of hot chocolate while watching Elf & know that your business is in good hands. Whether its email management or social media assistance, we can help you out!